So far we've had winners from Australia, Canada and the US. Tonight's winner is from the UK. Drum roll please ... It's Amanda from Surrey. Congratulations Amanda. I trust the 1" and 2" hexagons will help speed up your patchwork project. And here's a sneak peek of something else that I hope will save hexie-lovers lots of time ... die-cut fabric hexagons. I die-cut these fabric hexagons today from Moda Layer Cakes. The first lot is from the Hometown by Sweetwater layer cake and the second is from the Etchings by 3 Sisters layer cake. 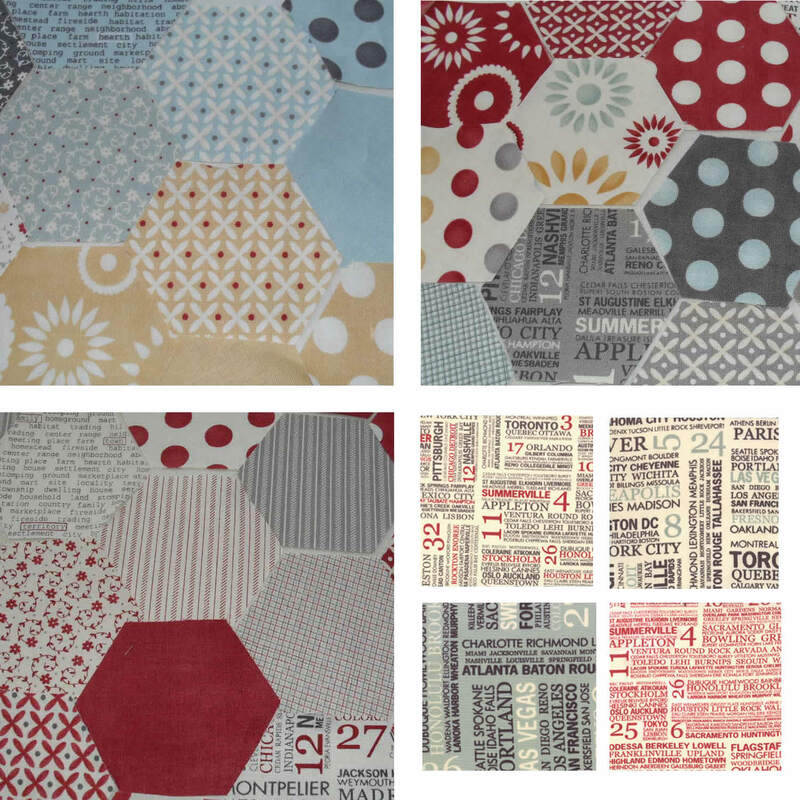 Each pack contains 7 hexagons from each of the 42 fabrics in the layer cake. That's almost 300 pre-cut fabric hexagons in a pack. Pre-cut! Imagine the time you'll save! 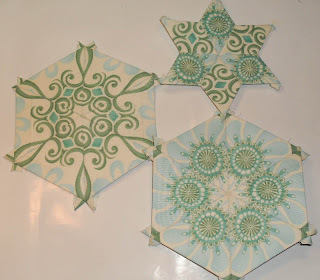 Use these with my 1" paper, card or freezer paper hexagons. I'll list these shortly in my store, and I'll die-cut some other layer cakes as soon as I can. I hope people will love them as much as I do. It's another short post tonight. I've just come home from a lovely (but long) day giving craft lessons to friends of a friend. It's the first time I've given lessons in at least 10 years. 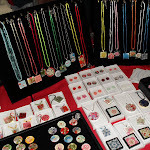 Some people wanted to learn how to make bottle-cap necklaces, others wanted to do dog-tag pendants, and others were keen to do patchwork. We ended up doing everything! Hence, the very long day. It was nice to be able to provide "the students" with my die-cut paper hexagons and fabric hexagons. It meant we could get straight into stitching, and everyone went home with a completed hexagon flower. A nice accomplishment for just one lesson. 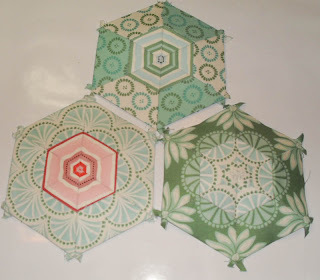 Speaking of hexagon flowers, Janet from Canada (who happens to be one of my partners in the Inchy Hexagon Flower Swap) has won tonight's draw, and I'll be sending her 2 packs of my die-cut paper hexagons to help her flower garden frow. See you all tomorrow night for the next draw. Existing entries are still in the draw, and new entries are welcome. 7 nightly draws still to go, enter at http://pbpatch.blogspot.com/2011/07/my-first-blog-day-3-its-time-for.html. Just a quick post tonight to let you know that tonight's winner is Mommarock from Texas who is interested in the 2" triangles and 1 1/2" diamonds. Sounds like she has a specific project in mind. There are 8 more nightly draws to go. All existing entries are staying in the box (except this winning one), and entries from new people are welcome. For full details, and to enter the giveaway, go to http://pbpatch.blogspot.com/2011/07/my-first-blog-day-3-its-time-for.html. It's time to draw the first winner of my first giveaway on my first blog. I'm running a little late - I got side-tracked reading all your blogs. Before I do the draw, I just wanted to say a big thank you to you all for your wonderful response to my blog. Your welcomes and comments have been so encouraging. I've tried to reply to you all, but I have the feeling that some of my emails have gone to no-reply@blogger.com. Sorry about that. There are 9 more nightly draws to go. All existing entries are staying in the box, and entries from new people are welcome. My first blog - day 3 - It's time for a giveaway! It's day 3 of my blog already and it's time for a giveaway, don't you think? 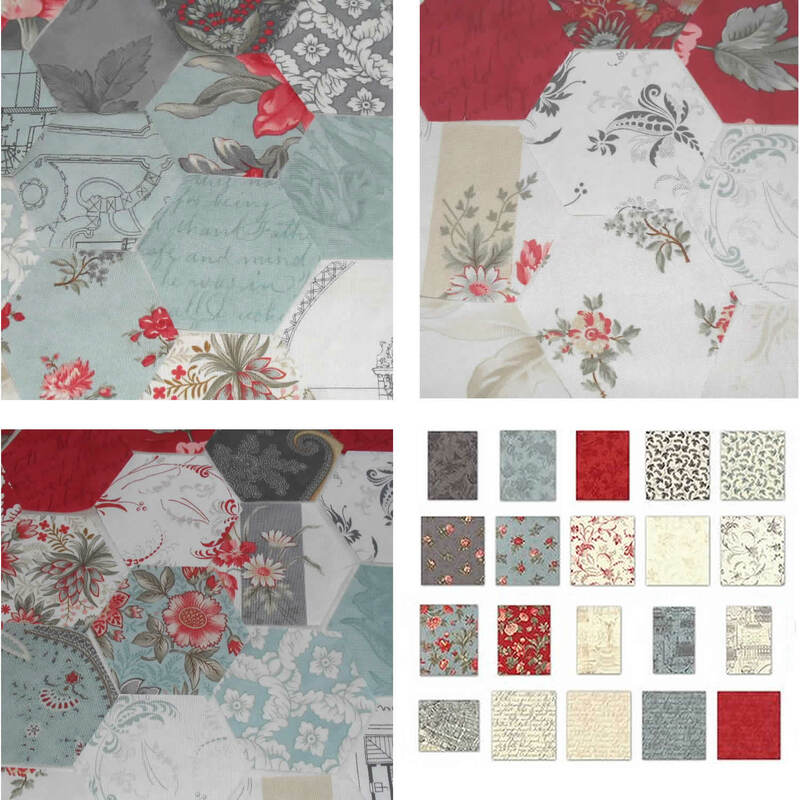 Plus, I'd like to introduce my online store, Possum Blossom Patchwork. I make die-cut paper pieces for English paper piecing. You know, hexagons, triangles, diamonds and the like. I make them from paper, card, freezer paper, whatever you like. Die-cut paper pieces are a cost-effective and time-saving option. I also have an electronic cutter which allows me to custom-make any shape in any size, so if you don't see what you need in my store, just email me and ask. I'm located in Sydney, Australia but international orders are no problem at all. If you prefer to order through Ebay or Etsy, I can handle that too. That's enough about me, let's get to the giveaway. I'm not exactly sure if there's a right way to do this so I'm going to keep it simple. Basically, each night for the next 10 nights starting tomorrow night (28/07/11 Sydney time) I'll draw a name. Each winner can select any two packs of die-cut or e-cut paper pieces or card pieces from my store (100 pieces per pack, you choose the shape/size). Open to everyone including international. Free shipping included. 1. Visit my online store and have a look around. 2. Post a comment on this blog saying which two shapes/sizes you'd like to win (either a pack each of 2 items, or 2 packs of one item). 4. And if you want to follow my blog, mention that too for a third entry. Names/comments will be placed in a box and one will be drawn at random each night. Non-winning names will remain in the box until the end of the giveaway, so if you write a comment before the first draw that means you'll get 10 chances to win. Or 20 chances. Or 30 chances. Oh, and remember to tell me how to contact you. If I can't contact you, I'll draw another name at the end of the giveaway. P.S. Is there anything I've forgotten to mention? If so, email me. Winner 6 - 02/08/11 - QuiltKitty again! All existing entries (except tonight's winning entry) are staying in the box for tomorrow night's draw and all subsequent draws, and entries from new people are welcome. One thing I love about the blogosphere is that you never know where it will take you. You start off at one blog, click on another then another, and before you know it you’re trying to decipher a language you can’t read because the photos are so interesting. Now you know what I’ve been doing all day - reading the blogs of my new online friends. Thank you all for your kind welcome messages. I feel right at home already. I better make sure I don’t neglect my existing partners in the Inchy Hexagon Flower Swap. Every month I have a mad dash at the end to make my flowers for my swap-mates. I was so sure I’d meet the deadline this month as I made one flower in the first week of July … but (no surprise) I haven’t made the other yet! I love that this is an international swap. It was started by a fellow Australian, QuiltJane (also known as the Inchy Hexagon Gal), but so far I’ve received hexagon flowers from the US and Canada, the UK and Europe, Scandinavia and Iceland, oh, and Australia of course. There are lots of hex-mad people out there! 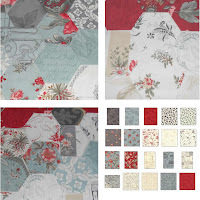 I must tell you a little about QuiltJane as her Want It, Need It, Quilt blog was the first blog I ever started reading on a regular basis. Her designs have been featured in the Moda Bake Shop, she has written tutorials for other blogs as well as her own, and I especially like that there’s so much colour and variety in her projects. The other thing I like about QuiltJane is her Want It, Need It, Quilt store. To be specific, I like the prices in her store. I haven’t found anywhere else in Australia that sells Moda charm packs and layer cakes as cheap as she does. It’s significantly cheaper, even better than buying from overseas. Her shop has other stuff too. 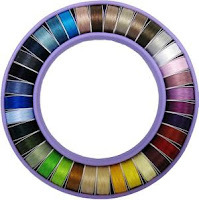 My latest purchase is Frosted Donut 2, 36 new colours of Masterpiece thread (100% Egyptian cotton). As soon as I saw this I snapped it up ASAP because I knew it would go quickly. And I snapped up Frosted Donut 1 as well because I missed out last time. 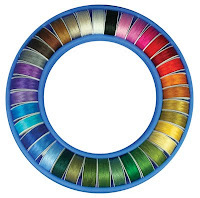 It will be so great to have a whole rainbow of thread (72 colours!) to choose from for my hexagons. I can't wait! Hi, my name is Joanne and I'm a hexaholic. I think I'd go mad if I didn't get a daily dose of hand-stitching hexagons. They are so easy to do, and so therapeutic. I can just zone out and forget about the day at work. On the other hand, patchwork has driven me crazy at times. It was love at first sight when I found my first patchwork book in my late teens, but who knew that a 99c bargain book would end up costing me so much! Hence my hexaholic tendencies. There's just something about making stacks and stacks of hexagons, especially out of little scraps of unwanted fabric, then playing around with them until the design unfolds before your eyes. What a great relief it was to find others like me! I no longer need to hide my hexie habit! 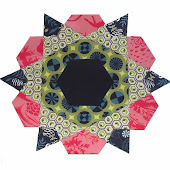 You can visit my hexie-mates at the Inchy Hexagon Flower Swap, the Craft Forum, and the Vignette Hexagon Quilt blog. Welcome to my first blog. I'm so happy it's finally here! I'm single and quite shy (ok I admit it, very shy) so you won't hear much about myself or family. I'd much rather stay home and be creative than travel and be adventurous, so there won't be loads of fabulous photos of exotic locations. I guess it will just be craft, craft, and more craft (and maybe occasionally a YouTube video that's just too hilarious to keep to myself). I do quite a few different crafts but I always come back to patchwork - mostly hand-pieced patchwork. It's my passion, my entertainment, my addiction and my therapy, all rolled into one. I'm a great believer in finding the easiest, quickest way to do something, so I'll be posting links for you whenever I find great tutorials, and I'll be letting you know about some great time-saving products that I make for my store. Oh, and my name is Joanne. Welcome everyone!